Moving on and overcoming her past were the two most important things on Heaven Montgomery’s mind as she traveled to a small quaint town in Maryland called Sweetland. She was there to adopt a chocolate lab puppy named Coco thinking what could be a better way of starting over than having a perfect companion with unconditional love, however she finds much more than she bargained for. Preston Cantrell, the current owner of this puppy, is drop dead gorgeous on top of being a smooth talker, so Heaven quickly finds herself pressing down the instant attraction to him. Her only reason for coming here was to adopt a puppy, she keeps reminding herself, but as a couple of days turn into a couple of weeks, Heaven finds herself falling in love with way more than a puppy. Preston, his family, and the wonderful town of Sweetland itself has her feeling that this place may be her new beginning, and hold her future. Unfortunately, when her past threatens to tear her from everything she is coming to love Heaven has to find the courage to fight for the chance to live her life and find her happiness. Sweetland was where Preston grew up and shared many good memories with his family but he is convinced that this small town could never be a place he would want to settle down. However, after the loss of his grandmother he joins the rest of his siblings in his hometown to come up with a plan on how to keep their family business thriving. 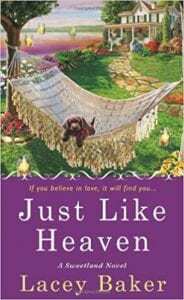 Preston knows he owes his family that much but as soon as things are settled he plans to return to his life in Baltimore, that is until a beautiful woman named Heaven Montgomery comes to adopt the puppy he inherited after his grandma’s passing. Suddenly his smooth talking ways and reputation with the ladies are not doing him any good as he desperately tries to learn more about this gorgeous woman who is creeping her way into his heart. There has never been another woman who has made him feel like this and then when her former life becomes a threat Preston knows he will do whatever it takes to keep her safe. When I picked up this book to start reading, I expected a typical romance story but was pleasantly surprised when I received much more. From the beginning it was shown that both Preston and Heaven had experiences in their past they were both trying to overcome and that added to the fun of the story as the reader is clued into both of their secrets. I think it always intriguing for a reader to get the impression they are behind the scenes and feel as if they have an upper hand on the characters, and that’s just want Lacey Baker did with this book. Of course that is what makes reading so enjoyable many times, as the thoughts of each character can be revealed in detail and Baker does a wonderful job of this. In addition to being an appealing romance, this story also held suspenseful elements of a mystery that kept me reading and hoping to find out what happens next. Quill says: Such a great combination of a compelling romance and thrilling mystery!